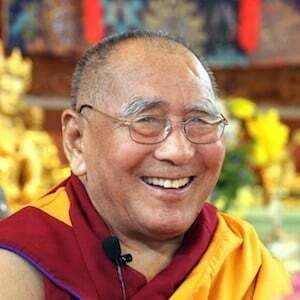 Geshe Lhundup Sopa was a brilliant scholar and well-loved teacher. Born in 1923, he was one of the last surviving Tibetan teachers originally educated in Tibet prior to 1959. He was chosen as one of the Dalai Lama’s debate examiners due to his reputation as a brilliant scholar. After the 1959 Tibetan uprising, he immigrated to India. His Holiness the Dalai Lama sent Geshe Sopa to America in 1962 and he stayed for the rest of his life. He was the founder and resident teacher of Deer Park Buddhist Center and Monastery in Madison, Wisconsin. Geshe Sopa was also a respected professor of Buddhist Studies at the University of Wisconsin for over 30 years and he retired as Emeritus Professor. He wrote a landmark five volume scholarly commentary on Tsongkhapa’s Lamrim Chenmo called Steps on the Path to Enlightenment . Geshe Sopa died in 2014. View photos of Geshela’s visit to the Abbey.